Litter of Airedales are on the way to be born around April 4th. Mother is a certified therapy animal who spends a great deal of time in high school classrooms and public libraries with younger children. Father is a very social and kind dog; an experienced family dog! Will start taking deposits after birth of litter. 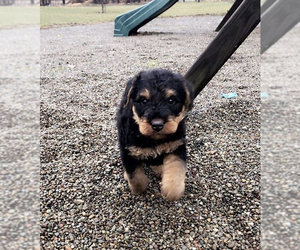 Overview: Airedales can be great family pets. They're fun-loving and great with children, though they should probably be supervised due to their large size and rambunctious spirit. Coat: Coat Is smooth, hard, and wire-haired. 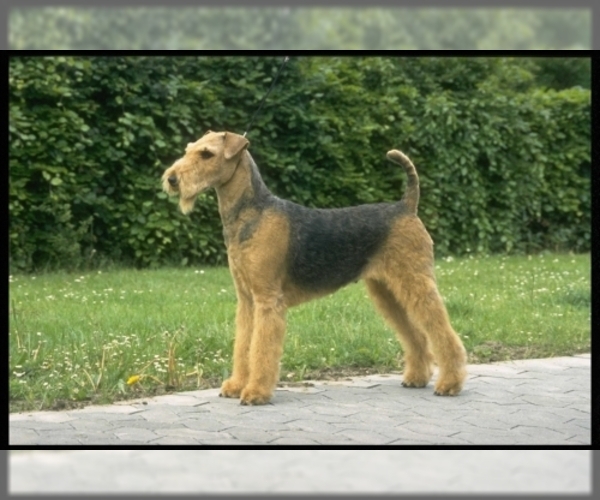 Character: Airedale Terriers are loyal, yet they have a stubborn streak. Infrequent barkers, these dogs make great playmates and are very intelligent. Temperament: This breed is very patient with children and tolerant of other household pets. 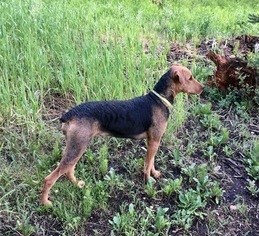 They may occasionally try to dominate other dogs, however, so training is required.Airedales can be an excellent choice for a family dog. Care: The Airedale Terrier's coat usually requires very little grooming. The hair should be plucked twice yearly. Show dogs require much more intensive grooming. Training: This breed is intelligent and understands trainers very well. Care must be taken to keep them occupied during training, however, as they can become easily bored. Activity: The Airedale Terrier should be allowed three walks a day, plus an ample yard for playing catch and running around. Health Issue: This breed is very hardy, but may suffer from eye problems, hip dysplasia, and skin infections.